On September 30, the Okinawa Prefectural People’s Forum for the Fostering of Children and Youth held the 36th Okinawa Junior Students Speech Contest at the Okinawa Civic Theater Ashibina in Okinawa City. Twelve contestants selected from six districts in Okinawa voiced their opinions on various issues. 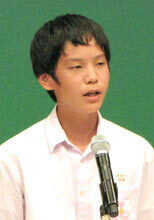 The second-grade student of Naha Junior High School Tenyo Takahashi won the Grand Prize. He made a speech on the theme of prejudice. He said it is important to understand each other as individuals, and not make assumptions based on national stereotypes. His manuscript and audio tape will be sent to a speech contest in Kyushu. The top two winners in Kyushu can take part in a national competition.